A massive storm aims for Southern California On Friday and Saturday, engineers are frantically reducing the outflow from Lake Oroville as major Storm set to dump up to a foot of rain over the early part of the weekend. The next name on the Southern California Weather Force list is Lucifer; he’ll certainly pack a major punch. With areas Ventura north and westward starting as early as Thursday, the strongest effects will be on Friday for the metros and high desert areas and Saturday in the Eastern Deserts. The SCWF Flood Watch is in place. Two small Earthquakes were recorded near Lake Oroville in the last 24 hrs. which appear to be a result of the fast lake level changes, and the subsequent release of pressure from water weight, reports WUWT. The reservoir exceeded its capacity over the weekend, which sent water overflowing into an unlined, emergency spillway. That overflow sent soil, rock and forest debris into the Feather River below. 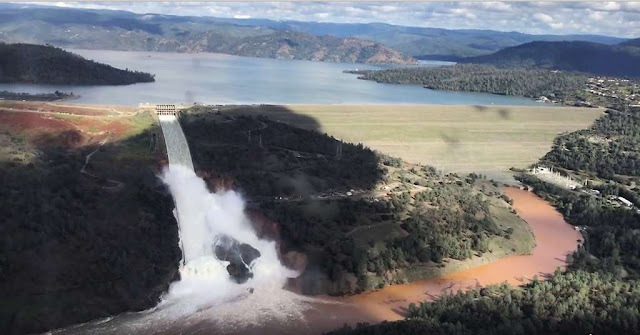 More than 100,000 residents south of the dam remain under an evacuation advisory and should be prepared to flee to higher ground should the dam overflow and the spillways collapse, authorities said, reports The LA Times. Yet another storm is going to hit the area early next week. The stricken Oroville Dam is in for more torrential rain as the jet stream will continuously pound California over the next ten days and bring huge amounts of moisture from the Pacific Ocean into the state. The dam will take a direct hit as the jet stream pounds California. After five years of a miserable drought, incredible amounts of rain have piled up in just two months across low-lying areas of the state, mountains of snow have accumulated in the higher elevations of the Sierra Nevada Mountains and much more is to come over the next 10 days. A storm arrived on Wednesday night witch will continue into Thursday with a second storm to California by the weekend. The average annual rainfall of about 50 inches had already been overtaken with 68 inches in 2017 alone and another 12+ inches is possible over the next week-to-ten days, reports Anthony Watts, from wattsupwiththat.com. Praying for everyone in the path of this serious situation. The storm name is not Lucifer. Why are you republishing fake news. Gosh. Sorry Marie I have been hoodwinked, not storm Lucifer, thank you! It's a bad link. SCweatherforce is run by a guy and his brother. It's not NWS. My fault Mary when it came out, seconds out the link was good and no one had debunked it locally, So.Cal. I sent it to BW right away as it's name was telling was it not? But it turns out the name was a hoax but the truth is in the pudding is it not? It will be a bad storm and already is. Research it, this is not a good topping to an already historic weather season for California. and the whole West Coast for that matter....fake name but the news is real. It will be a bad storm and people should take caution. But winds are forecast to reach 75 mph which barely touches category one on the Saffir-Simpson Scale (which also doesn't have a category six). SCWF always over-hypes bad storms to get traffic. They have been discredited by almost every legitimate weather organization including the NWS. And as an owner of a legitimate weather organization I can personally say how frustrating it is to see SCWF's exaggerated information spread around while those of us trying to provide legitimate information get ignored. But don't put QUEST in the same category as SCWF... I've known Anthony Watts for years and he really does provide well researched information. The News is NOT real....yes...there is a bad storm....but it's not a named storm at all....not even a category 1....and Lucifer is not a name on the actual list of Pacific storms for the next several years on the actual real weather service sites. Dude I live in San Diego, the storm is named Lucifer but I really can't figure out why. Anonymous....The News is NOT real....yes...there is a bad storm....but it's not a named storm at all....not even a category 1....and Lucifer is not a name on the actual list of Pacific storms for the next several years on the actual real weather service sites. Stop getting your news for hype locations! the third word in your article is spelled wrong. and it is what the entire article is about. STORM not SRORM.